And we may not stop there, he could be in the running for saddest man to have ever lived. 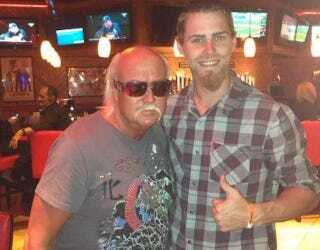 According to Reddick's tweet last night, he met Lil Hogan here at Hogan's Beach, which is a Hulk Hogan-themed bar/restaurant in the Tampa area. Reddick and the Athletics are in town this weekend for a series with the Rays. He is a mascot of sorts for Hogan's Beach, which would be a sad thing for sexagenarian who is not Hulk Hogan to be doing. He is not affiliated with Hogan's Beach, but he has styled himself after an essentially fictionalized character in Hulk Hogan and regularly patronizes Hogan's Beach in order to trade off the Hogan brand. This would also be a sad thing for a sexagenarian who is not Hulk Hogan to be doing. He is not affiliated with Hogan's Beach, has no idea who Hulk Hogan is and through some cosmic fuckery, too much sun and just enough LSD he has entered his twilight years with a cue-ball head framed (in back) with bleached-blonde hair, a handlebar mustache and Abraxas-inspired wardrobe options only to just so happen to stumble into a Hulk Hogan-themed bar/restuarant when a Major League Baseball player saw and tweeted a picture of him. This, again, would be a sad thi—it would just be sad for anyone, OK?